Silver beet is an interesting vegetable, I love it. I just feel the health oozing from me when I eat it. Nic thinks I'm silver beet crazy- "you want to put it in everything....." was his reply when he started making a bean and jalapeno stew the other night. I merely suggested its presence in the meal because it needed to be used up! I bought the silver beet for our night of flat head. If you have never crumbed silver beet then you've been missing out. It is a wonderful way to eat the green leaf, and the 'look' of it gives even the more distrustful 4 year old a reason to at least try it. It is very simple to make, you crumb it as you would crumb fish or chicken. I use fresh breadcrumbs for a crunchy texture and it absorbs the butter really well. 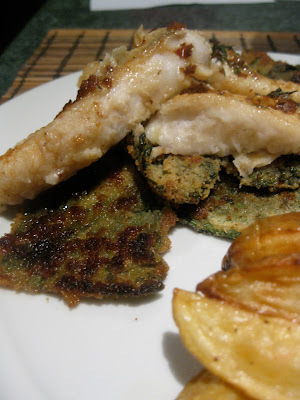 Once it is pan fried, I pop it in the oven on a low temperature while I quickly cook the fish. It is at this point when I have to admit I DIDN'T cook the meal, I left that in the capable hands of hubby Nic. After preparing the sliver beet I needed to deal with some work bits and pieces so he kindly took over. When dinner was ready it smelt wonderful as he made a delicious lemon and thyme sauce to drizzle over the fish. That matched with crisp pan fried silver beet and oven roasted potatoes..... it was a meal I couldn't help but get excited about. Max couldn't get passed the green silver beet, but Alex was hooked once he took a bite (I think it was the added butter that made him a fan!). If you're up for an experiment give the sliver beet a try and serve it with fish, chicken or lots of other veggies. I am sure you'll be happily surprised. Now you have done it... I am not familiar with Silver Beet. I see hours of study ahead of me now.